May in Tahoe and the weather forecast was uncertain. Snow had just fallen on the mountain peaks and the wind was, shall we say, brisk. 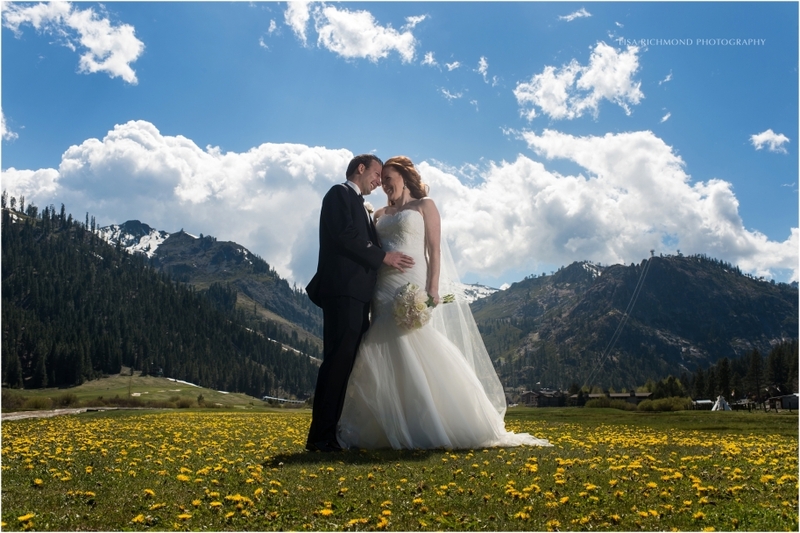 On Friday, gray clouds crested over the hill and the outlook on my assistant’s weather app was for rain right at the moment we were due to be standing in the middle of Squaw Valley’s famous meadow with our bride and groom. We checked our umbrella inventory and made contingency plans. But, at the end of the day, we needn’t have worried because the sun was determined to shine on Carrie and Mike’s big day. Aside from a strong breeze which played with Carrie’s full-length veil, the weather was perfect: sunshine, blue skies and fluffy white clouds. Having dated for a couple of years, Mike proposed to Carrie last September, surprising her on a bike ride to Tiburon by pulling over with a fake-cramp. As he got down on one knee, roadside, family and friends descended on them with cameras in-hand to capture the moment. Carrie had been expecting him to propose on their upcoming trip to Maui and so she was completely surprised. 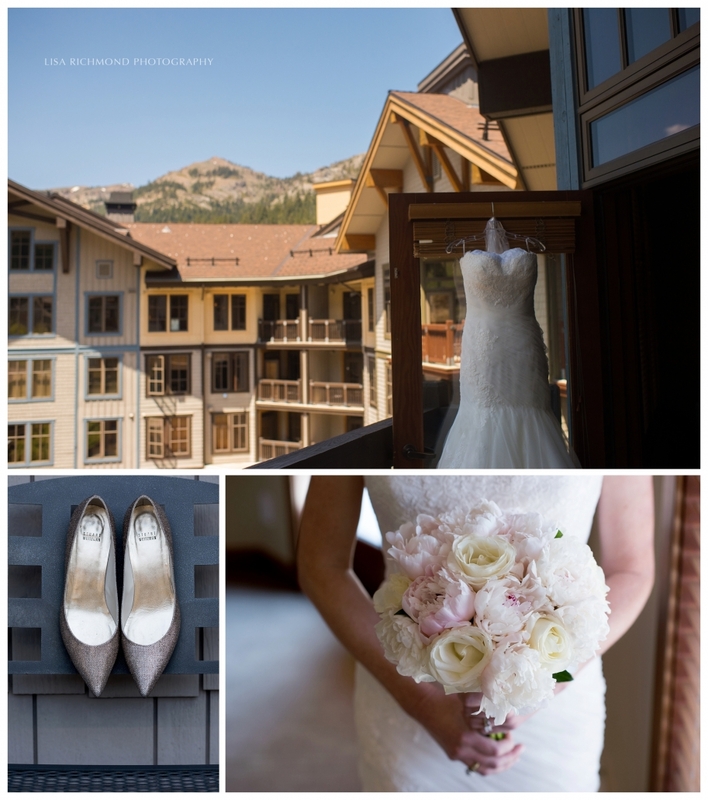 They had already talked about getting married in Tahoe and so all that was left to do was put the plans in motion. We had so much fun photographing this couple who truly gave control of all the little details over to fate (and their capable team of vendors) for the day, determined to live in the moment and enjoy time spent celebrating with family and friends. All 200+ of them. 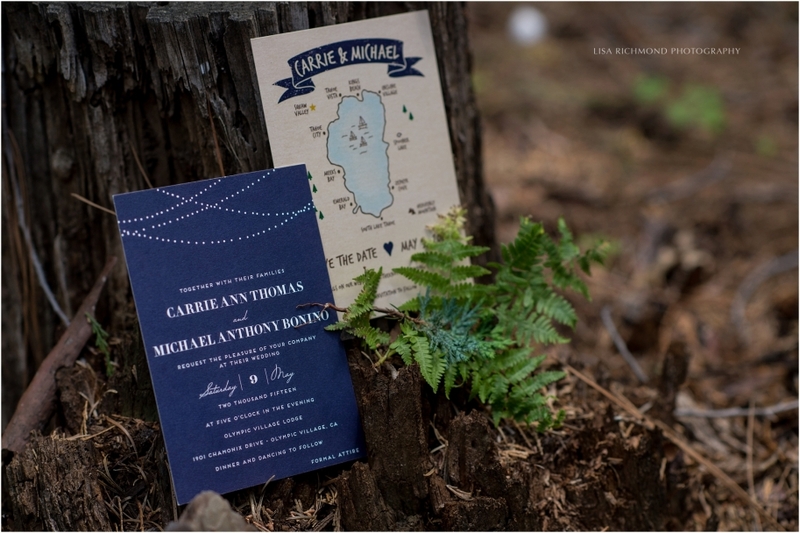 This was a big wedding and yet one that still felt connected and intimate, a tone set by who Carrie and Mike are: organized and yet laid-back, genuine, playful and full of laughter. We have so many images of them mid-laugh with big, wide smiles. And those moments in the meadow before the wedding, when Mike saw Carrie for the first time and we got to capture them surrounded by mountain peaks and beautiful skies? Magic. It was also wonderful to see two of our old friends, Emily and Shannon, whose wedding we shot almost 2 years ago to the day. Emily and Carrie have known one another since second grade and Emily was generous enough to refer Carrie and Mike to me. It was great to thank them in person as well as see some pictures of their beautiful daughter, Fiona. Thanks to Camielle at the Olympic Village Lodge where the ceremony and reception took place, as well as DJ, Brian Hess, who made our jobs easier by being so great to work with and to the fabulous Michelle McDaid for second shooting and assisting. Thank you Kathy for your kind remarks. I was sad that we didn’t get to see you all or Fiona…Emily and Shannon looked like they were having a great time. Such wonderful grandparents! I’m sure you are loving it! Unbelievably beautiful photos. What a beautiful bride and your capturing her Mom’s emotion at that special moment is priceless. The setting, the weather and the connection with Emily and Shannon all so special to see. Although we were in a room nearby taking care of Fiona, these photos make me feel as though I attended. Thank you.